Can you see what went wrong with this one? I shared this pic to my Facebook business page that night and a few eagle eyed customers spotted the problem! The card was designed as a landscape orientation but I mistakenly stamped the card insert in portrait layout. Duh! Luckily I didn't have to restamp the whole insert I just cut out the words and adhered them to a new Whisper White card insert and then stamped the fish again. And here is the card in all of it's colorful, pun-y glory. 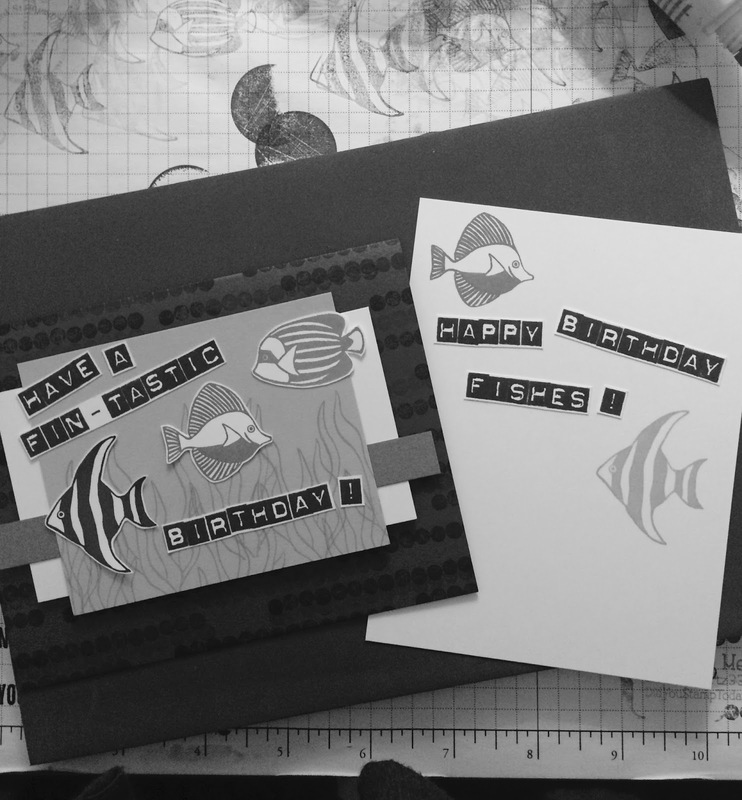 My boys get a kick out puns so it was a no brainer to do a few to go with the fish theme of the card and the Labeler Alphabet stamp set makes it so easy. The card base is Dapper Denim with the circle stamp stamped randomly all off the front. I layered a bit of Whisper White next (I think this might have been a sketch challenge from a while ago but I don't remember which one!). A small strip of Bermuda Bay comes next. The seaweed is stamped in Lemon Lime Twist onto Lemon Lime Twist cardstock. The fish are stamped in Dapper Denim, Tempting Turquoise, and Bermuda Bay and then fussy cut. I popped them up with dimensionals across the LLT panel. The Labeler Alphabet was used with black ink and then just snipped out with my paper snips. So my takeaway from this card is that clearly I need to not be stamping at night and I really need to be more organized with birthday cards. We'll see if I can work on that for next year's birthday week! To continue with my summer theme of "Always Behind" I'm sharing a card I made way back in June for Ryan's soccer team coaches. I made 3 of these card to go along with the thank you gifts from the team parents. Ryan has been playing with the same team with basically the same coaches for 4 years (or maybe more now, I can't even keep track!) and with 2 seasons a year I've had to come up with a lot of different thank you designs and I don't always have a current soccer stamp to work with. This year I decided to do clean and simple texture with the 3 colors of team. The 3D Dynamic Textured Impressions folders give such awesome impressions you really don't need to add too much more to a card like this. I thought the Hexagons folder was perfect for a soccer theme. 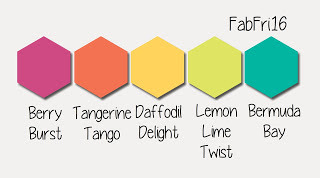 I cut the Basic Black, Whisper White & Tangerine Tango panels and put them into the folder lined up so all the hexagon shapes matched up once I adhered them to the card front. The large thank you sentiment from One Big Meaning was stamped in black and then popped up with dimensionals. I still have a lot of the retired candy dot embellishments so I added a few of those around the sentiment because why not?! I think this design could be easily changed for a sports fan birthday card with team colors and a birthday sentiment. Today's card is one that I made for a friend who got married back in the beginning of July, which seems like forever ago now! We had fun celebrating with the happy couple and enjoying a weekend away. There is very little stamping on this one but lots of layers and sparkle. The base is Soft Sky and then a layer of Silver Glimmer paper topped with Whisper White embossed with the Softly Falling embossing folder. Next is a narrow Basic Black flag and a length of silver 1/8" ribbon. I cut out Silver Glimmer paper letters with the retired Little Letters thinlets and an ampersand with the retired Typeset Alphabet die. These are all adhered to a Soft Sky panel. The congratulations was heat embossed on vellum. I adhered it to the bottom part of the ampersand with a glue dot then covered the gluedot with a rhinestone. I have been so slacking with my blog lately! I can't seem to get into a good rhythm of stamping AND sharing! We've have VBS at our church this past week and of course I am one of the craft ladies. It's hard work getting 100+ kids, ages 3-10 through the crafts station every day. We have a great team and we're having fun but when I get home at lunch time there isn't too much energy left for creative work! My family would probably say there isn't much energy left for interesting dinners either! But I do have a card ready for today's newest Fab Friday challenge! We have a fun sketch challenge and hope that you can join us with a design of your own. I'm a firm believer that you can't have too many birthday cards in your stash so I went with a very pink birthday card this time! I'm generally not a huge pink fan and rarely use the lighter pinks except for accents and baby girl cards. I thought the sweet cupcake would work well with the new In Color Powder Pink. The Coffee Cafe stamp set clearly has the market cornered for coffee themed images. The cups and accessories are fun for all your caffeinated card making needs. But what might not be apparent is that you can use this set to make cupcakes as well. That whipped cream stamp looks great a frosting (or icing if that's what you call it....any baker's out there who can tell me the difference??) and the woodgrain cup pattern as well as the plain sleeve stamp make for pretty nice cupcake bottoms wouldn't you say? I used Powder Pink ink for the frosting and the hearts sprinkled around. Chocolate Chip ink is the cupcake bottom and the sentiment from Tabs for Everything. I put everything together with a doily, 1/2" woven ribbon in Powder Pink, white baker's twine and some rhinestones. I'm looking forward to seeing your beautiful creation in the Fab Friday gallery! Now get to work! And here we are 2 weeks gone again we're back to another great Fab Friday challenge. We have some fun colors this time around. Don't let the fact that there are 5 colors deter you! You can do it and a make a FABulous card with them! They are a bit of rainbow set of colors aren't they? I decided to go with a bright bouquet of flowers. I thought it was perfect for summer. And it's also my first time stmping with the new Beautiful Bouquet stamp set which has just a ton of stamps...37 in all! There are great all occasion sentiments to pair up with the fun blossoms. I hope you'll joing us! 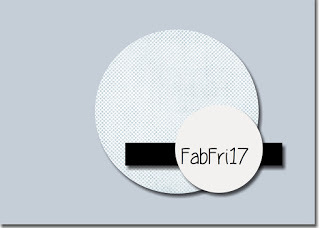 Remember you have 2 weeks to participate in the Fab Friday challenge! See you in the gallery! It's so hard getting back into some kind of routine after being on vacation. Add in it being summer, a mid-week holiday and a dog that decides at 3:50am that it's time to get up I'm having a rough time! I told my husband that I feel like a zombie minus the brain eating thing this morning. I may just need to take a nap this afternoon. I'm glad I have a few cards that I made before vacation to share since I'm thinking there might not be too much creativity happening in my stamp room today! I made this card for a sketch a few weeks back and of course didn't get it photographed in time before the challenge ended. I thought the layered circles in the center was a neat design element and went through my stamps to see what would work. Sirly Bird flowers fit the bill. The top flower is stamped in Berry Burst then the swirl is embossed with silver. Another larger swirl, also stamped in Berry Burst, is layered behind it. The largest circle is a Basic Black Stitched Shape framelit circle. I layered all of the circles on top of a Whisper White panel that was scored diagonally. The happy birthday sentiment from Balloon Celebration is embossed in silver on Basic Black. A few small rhinestones and a silver cord finish off the details for this card. I better get going on my to do list to make some time in my day for that nap later! Happy 4th of July! We just got back into town after a trip up north to visit family and then further north to a good friend's wedding. The wedding was in Boston so my husband and I explored the whole Freedom Trail (and then some) and we got to learn so much of our American Revolution history! We saw many of the important historical sites that played such a big role in our country's founding. And a lot of graveyards! They are tucked all over the city and actually quite interesting from a historical perspective if you just don't think about how many people are under your feet! I know our country's history is just a speck of time compared to other countries but just being able to walk the same streets and learn more about the patriots lives was so interesting. I think we walked about 9 miles and it's a good thing we live in Virginia and are used to heat and humidity because it was a hot one! The This Little Piggy stamp set is so cute and is easy to color! The images are pretty open so you can color them in quickly. This one is stamped in Stazon onto Watercolor paper. She (he?) is colored in lightly with Calypso Coral using an Aquapainter. Her ear and nose have a few extra layers of Calypso Coral to make them a bit darker. The wings have just the lightest touch of Pool Party and then they are colored over with clear Wink of Stella to give them a bit of sparkle. Once she was all colored I cut her out with the Stitched Shapes framelits oval. I added just a little bit of color with a DSP flag on the edge of the oval. This is the Delightful Daisy DSP and it works perfectly with this watercolored image because it's a lighter shade of Calypso Coral and has a bit of watercolor wash look itself. The card base is Pool Party with rounded bottom corners and then the little cloud is stamped all over the front in Whisper White craft ink. The piggy panel is popped up on the card front with dimensionals. Doesn't it just bring a smile to your face? Have a great holiday with family and friends!